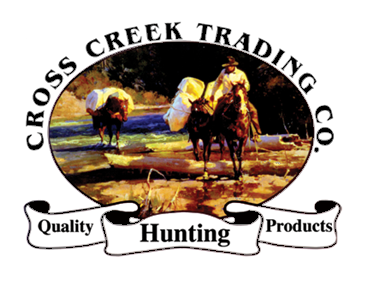 Welcome to Cross Creek Trading Co.
At Cross Creek Trading Company, we would like to introduce what many feel are some of the finest quality hunting products on the market today - made by hunters for hunters. Cross Creek started with the idea in mind to manufacture the best big game care products that could be offered to the hunter. We felt there were no such products on the market and knew we could fill that need. Our products are second to none and carry a full money-back guarantee! Made of light-weight aircraft aluminum and powder coated for even more strength, this adjustable packer allows you to carry animals out of the woods easily. With an adjustable waist belt from both sides, padded shoulder and waist straps, this compact design is comfortable and easy to wear! It comes complete with its own carry bag with belt loops and no tools are needed for assembly. Simply the best take-down pack in the business.